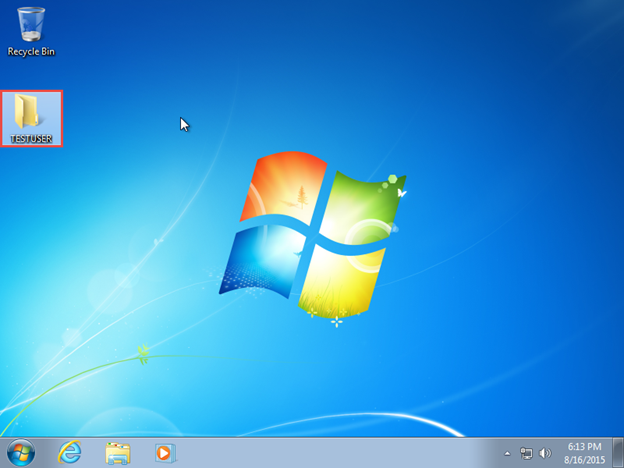 In this guide I will show you how to perform Profile Redirection in Windows 7. We will set up a different partition for user profiles, make changes to the system registry and verify that new users will have their profile directory changed to the new path. For existing users (users who had already logged into the system before and had their profile path stored at the default location in C:\Users), we will perform another minor change in the registry and manually copy their profile folder from C:\Users to the new path. 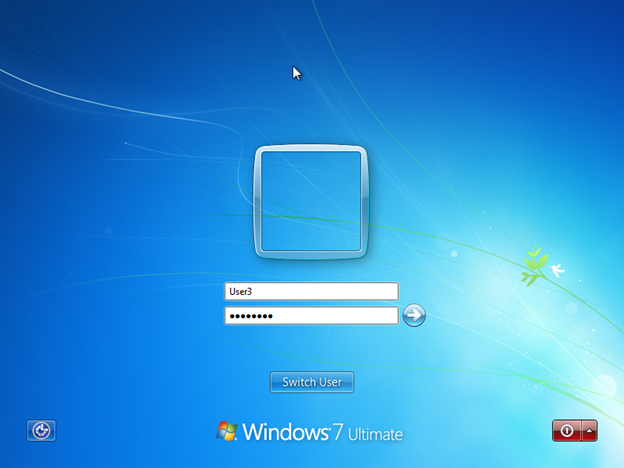 I start with a clean installed Windows 7 Ultimate with a user account called User. 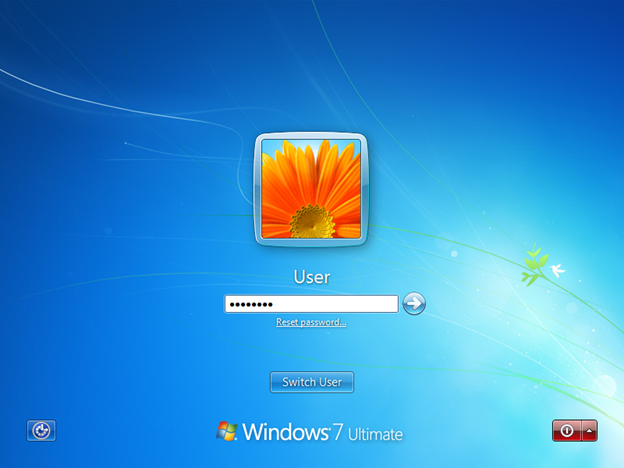 This account is created when I first installed Windows 7. to you that is the case, open the Control Panel, click User Accounts and it will list the user accounts you currently have. 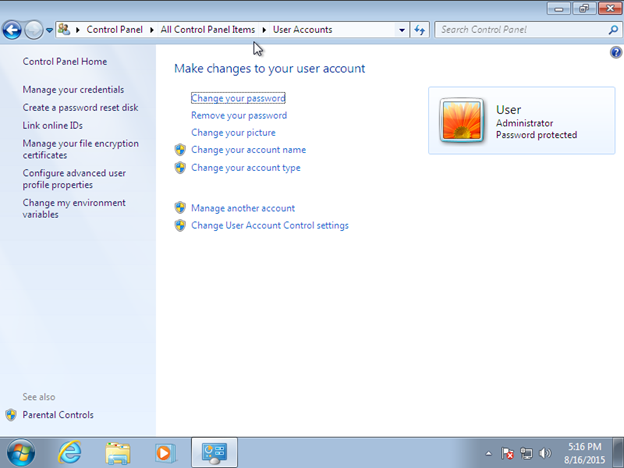 To show you what the account I am currently logged in as, click the Start menu. Note that the acount I am logged in as is User. That is the only account I have on this computer. To show you the location of the user profile, click Start, type CMD in the search box to launch the Command Prompt. Type SET at the command prompt. Here is the contents of C:\Users. And here is the contents of C:\Users\User. 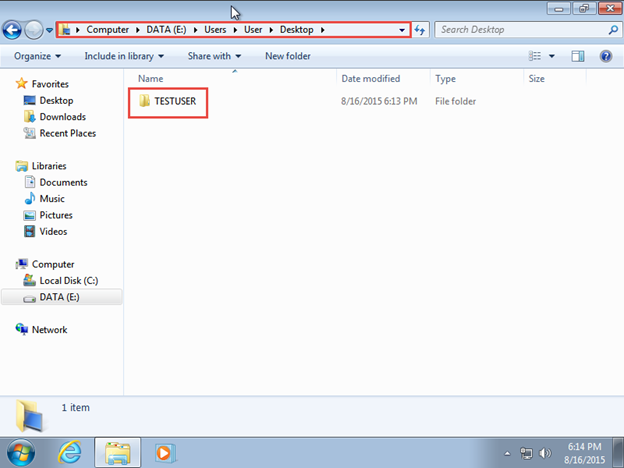 I am going to create a nother user called User2 and I will show you the profile location for that user. Open the Control Panel and click Users. Click Create a new account. 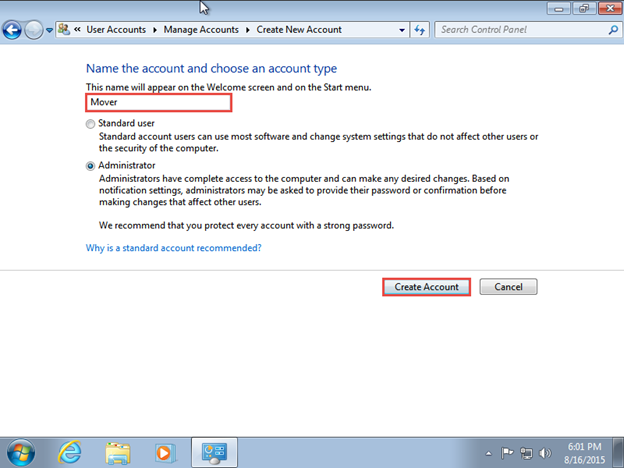 Enter the user name and click Create Account. 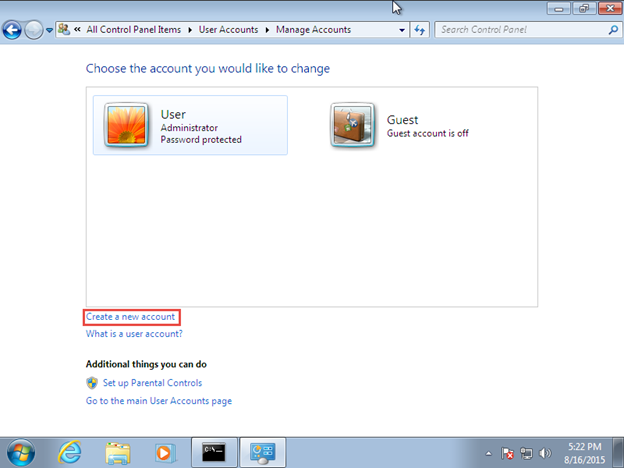 After the user has been created, click on the account and create a password for that user. 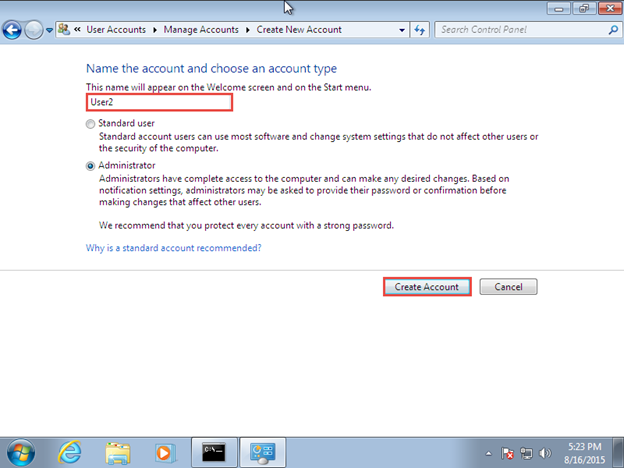 Enter the password and click Create password. 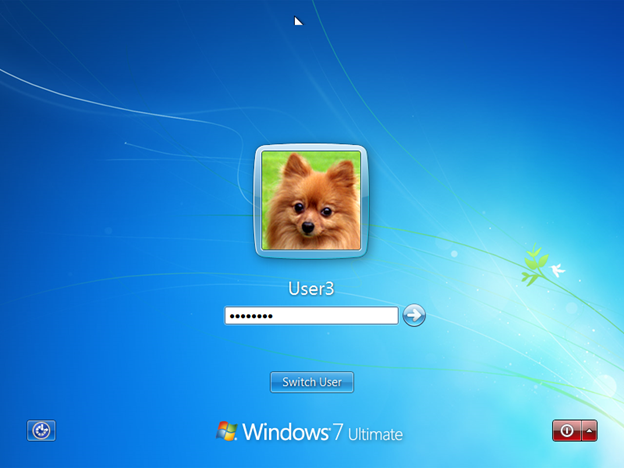 Let’s log in as User2. 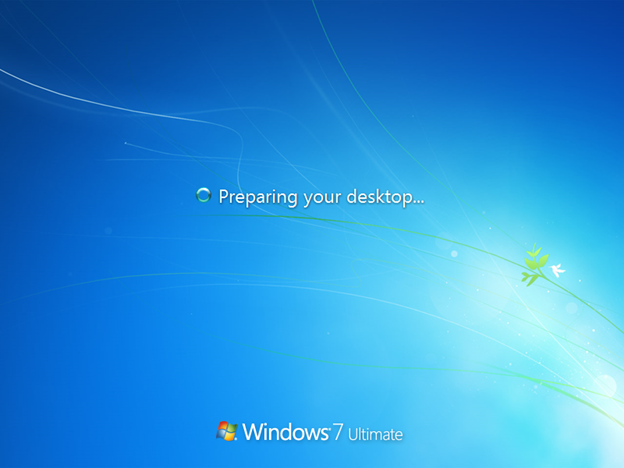 Wait for the desktop to be prepared. Let’s see the profile path for this user. 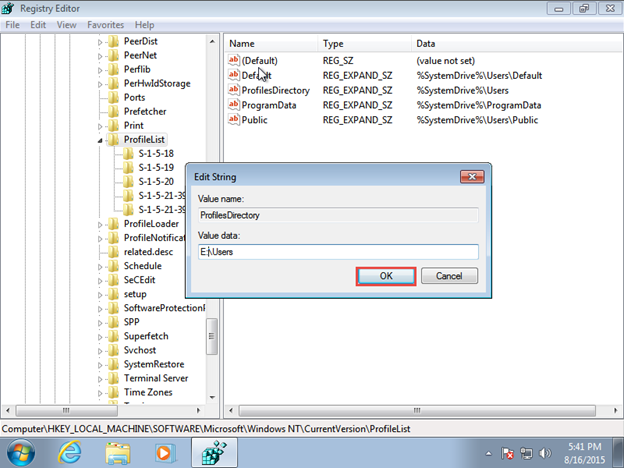 Launch the Command Prompt and type SET. Clearly, the path is under C:\Users\User2. And the contents of C:\Users\User2. 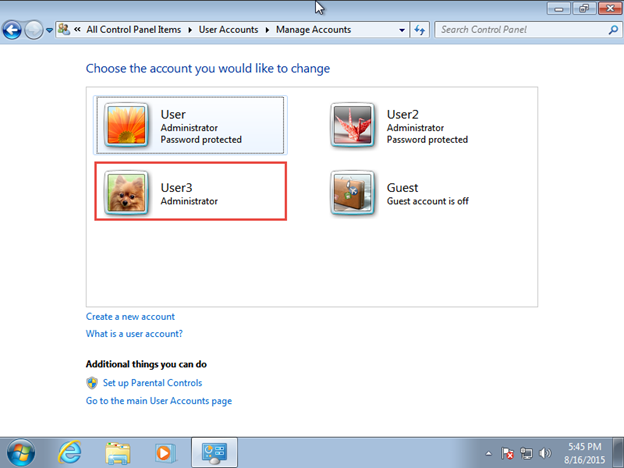 So it seems that by default, any user you log in has the profile stored in C:\Users. You wonder what regulates this and is there a way to change that to a different location, perhaps, to a networked location for instance. The answer is the registry. 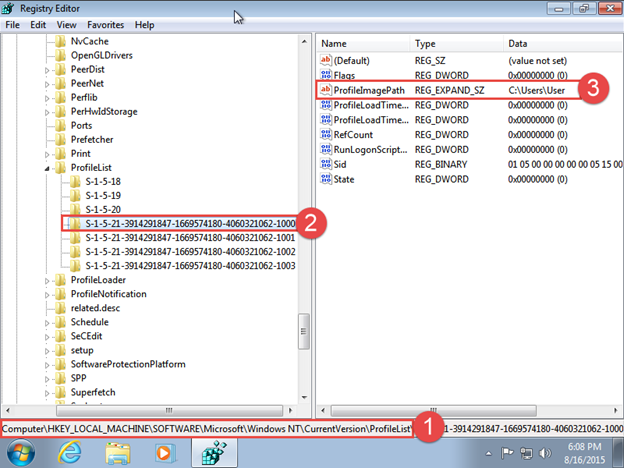 Launch Regedit.exe and browse to the following key highlighted in red. 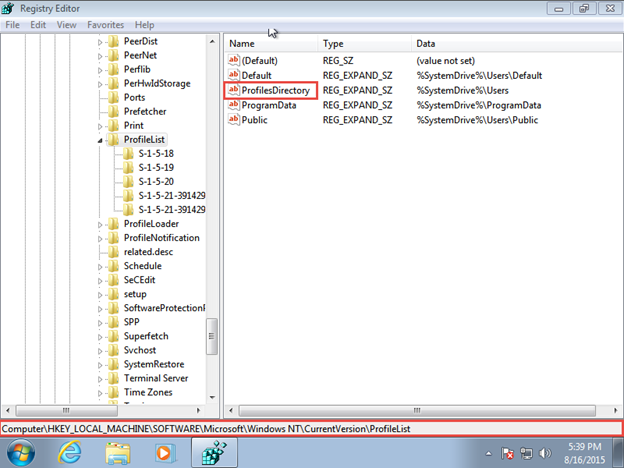 You will see that the ProfilesDirectory is currently %SystemDrive%\Users. Let’s change that path to another drive, for example E:\Users. Note that on the computer, I have this path existed. In this registry, browse to the key indicated above, double-click on ProfilesDirectory. Type in E:\Users and click OK. Note the new updated key value. From this point on, any NEW user logged into this computer will have the profile stored in E:\Users. 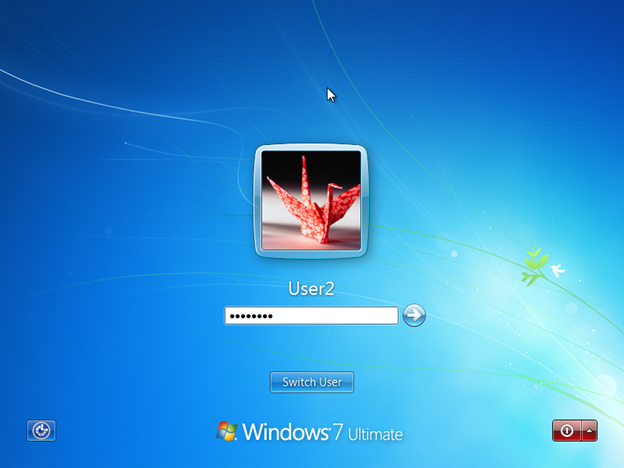 Only User and User2 have their profiles stored in C:\Users. This is because they have already logged into this computer before. Let’s create User3 and log in to find out. Fill in the user name and click Create Account. 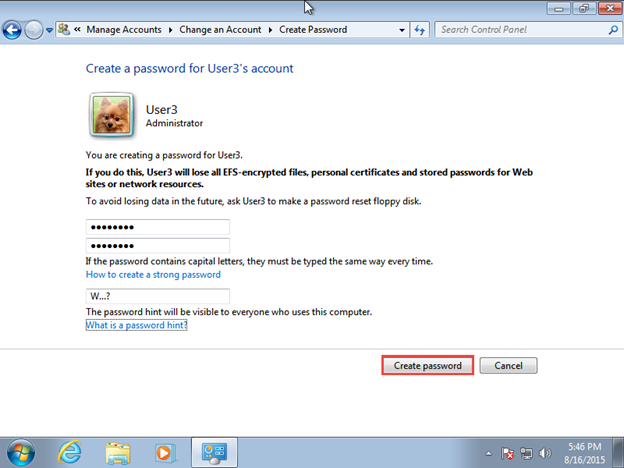 Click User3 to create a password for it. 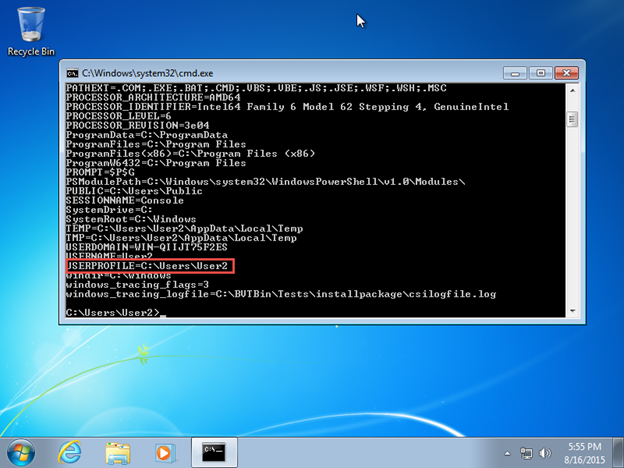 Open the Command Prompt and type SET. Clearly, the profile is stored in E:\Users\User3. 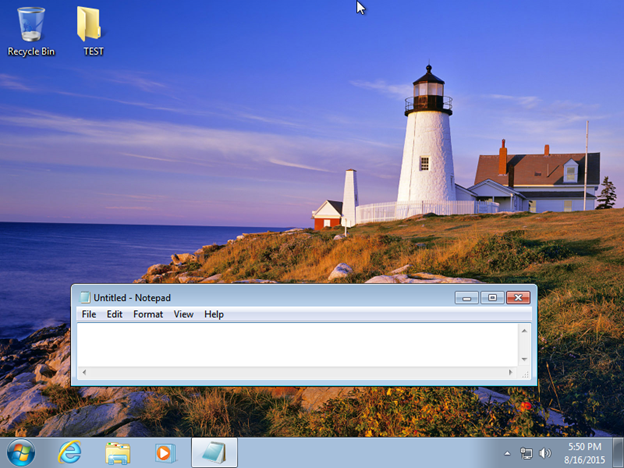 c/ Open Notepad and resize the application Windows. The above three things have been performed as showned below. Restart the computer and log back in as User3. The above three items should be remembered. 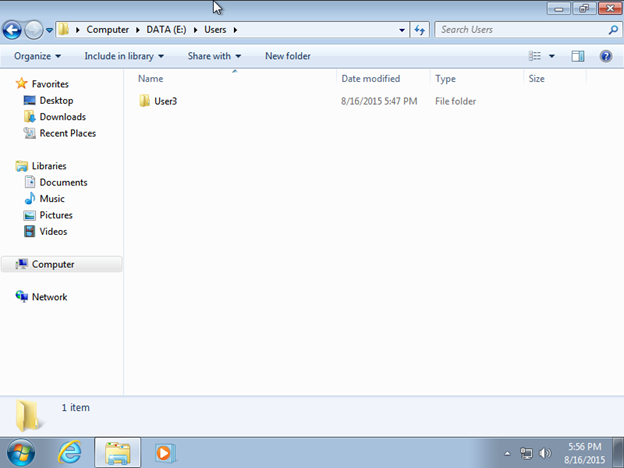 They are stored in E:\Users\User3. 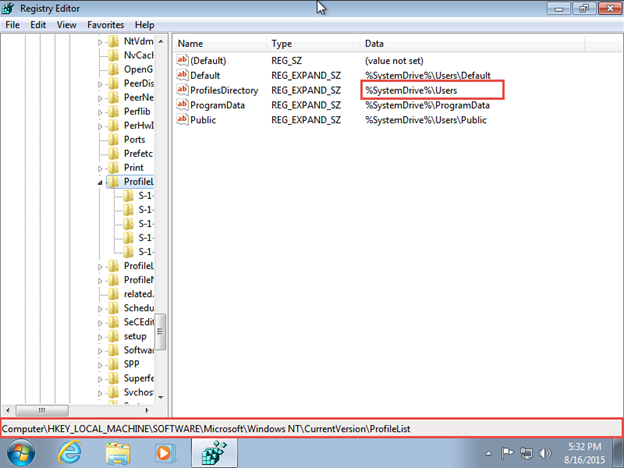 Reopen Notepad to make sure that the application size is exactly as when we left it last time. 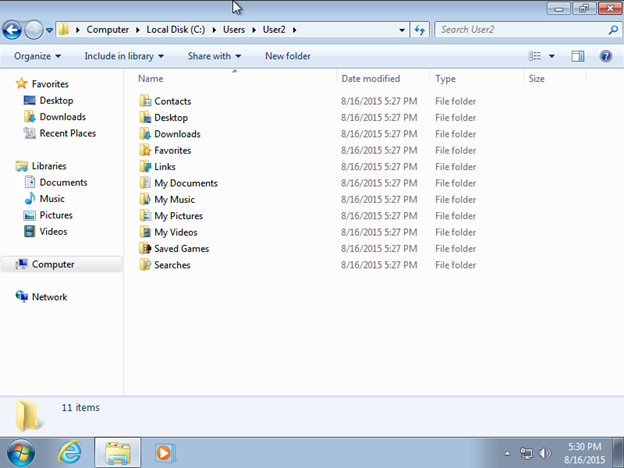 The folder TEST on the desktop is stored at E:\Users\User3\Desktop as expected. Now, let’s log in as User2. We will see that the Profile is still in C:\Users\User2. 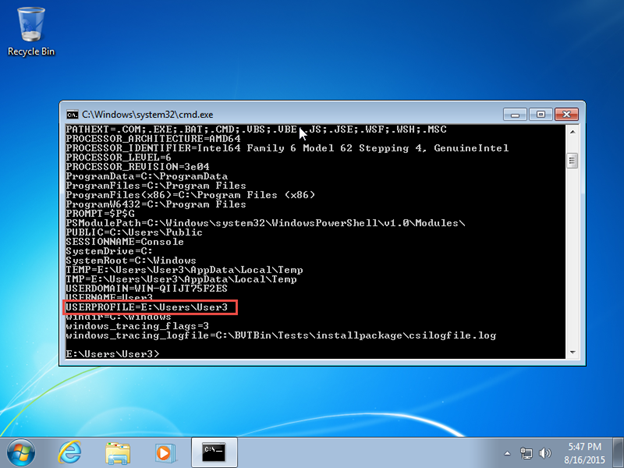 Launch the Command Prompt and type SET. Verify the profile path. 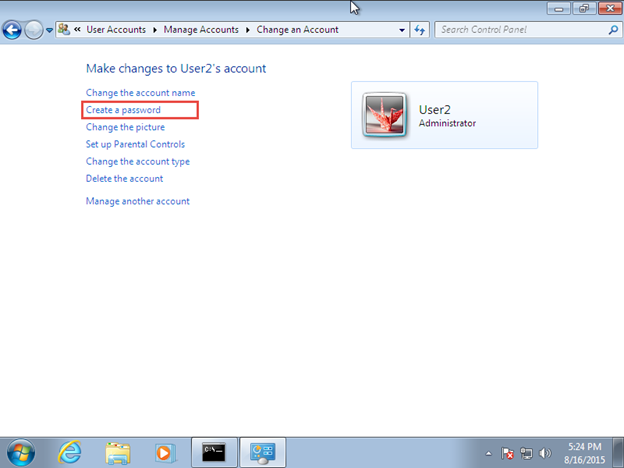 Verify profile path for User2 is still under C:\Users\User2. 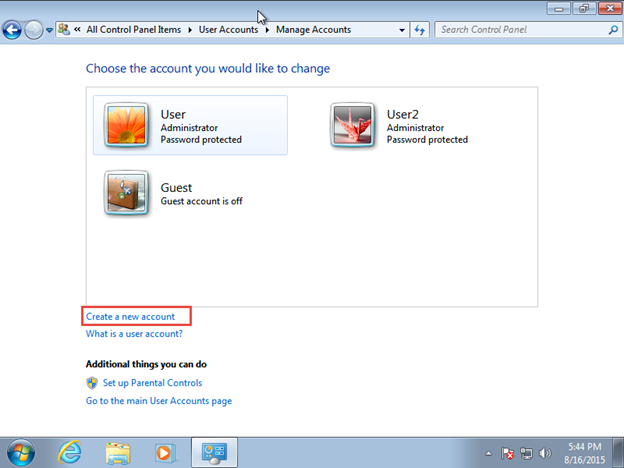 In order for User and User2 to have profiles pointed to the new location (E:\Users), we need to move the actual profile folders from C:\Users to E:\Users. Let’s do that. 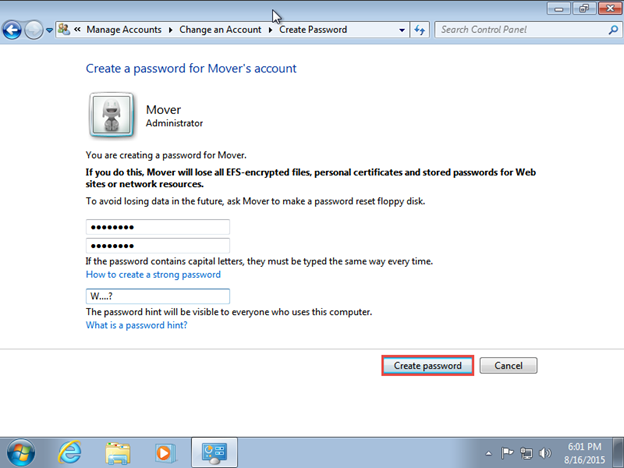 First, create a new temporary user called Mover. 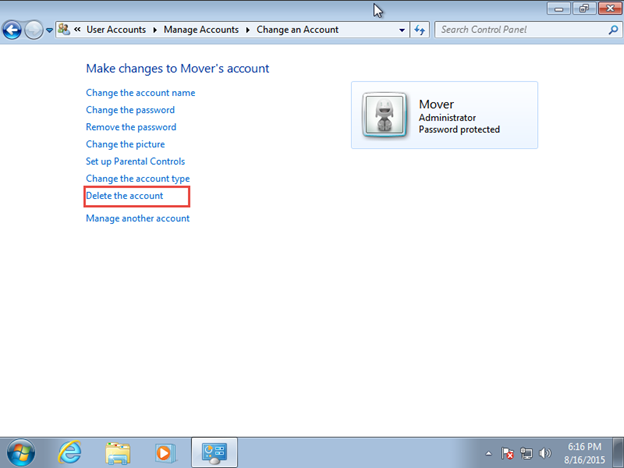 Then restart the computer, log in as Mover, then we will be able to copy C:\Users\User and C:\Users\User2 to E:\Users. 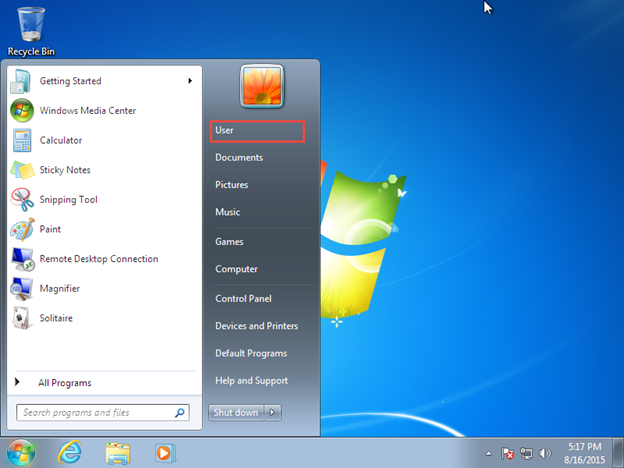 (Note that I could do this with User3 instead of create a new user called Mover but I like creating new users ;)). 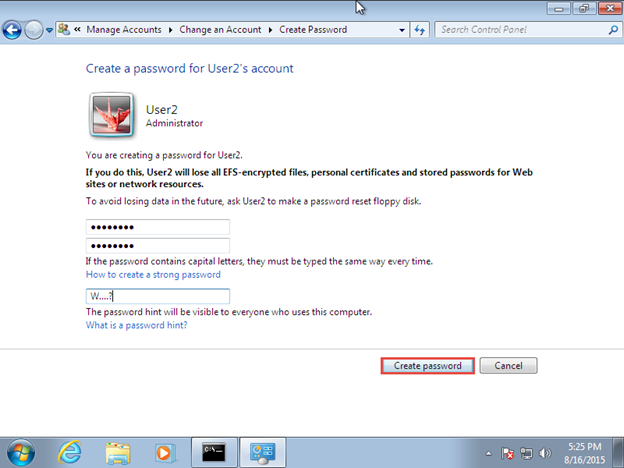 Create a password for the user Mover. 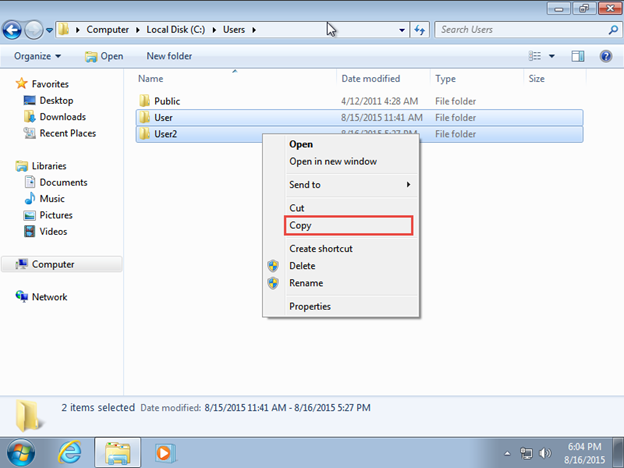 Select both User and User2 to copy. Even at this point, when you log in as User and User2, the profile is still in C:\Users. 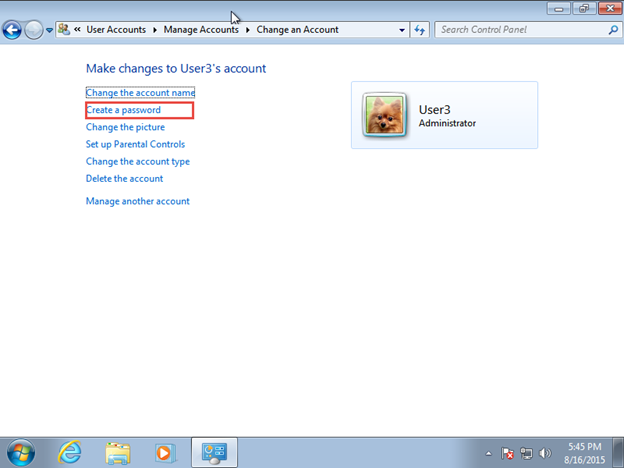 There is something in the registry that we need to change for the profile path to be switched to E:\Users. 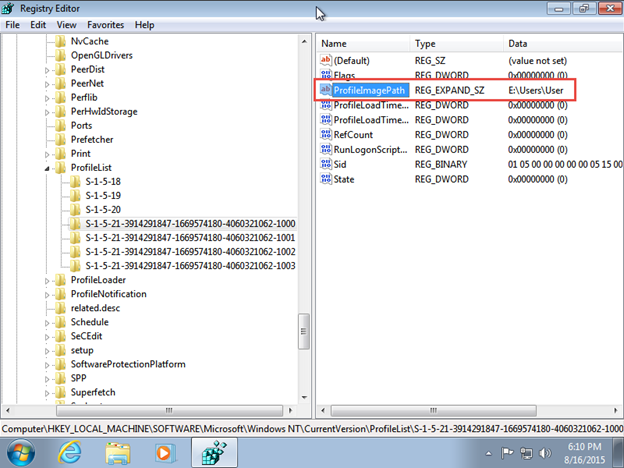 Open the Registry and browse to the Key highlighted below. 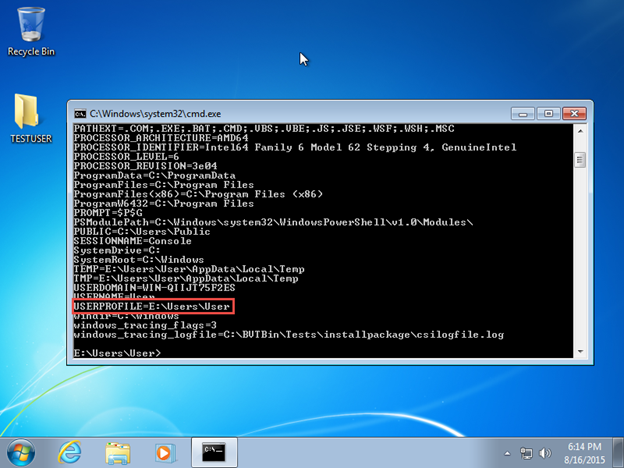 Change the ProfileImagePath for User from C:\Users\User to E:\Users\User. 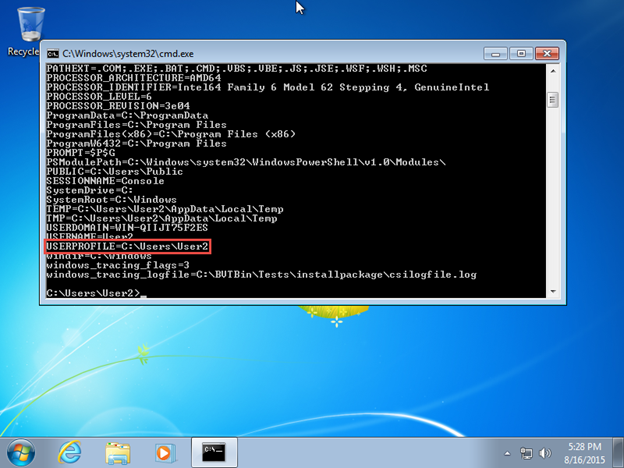 Change the ProfileImagePath for User from C:\Users\User2 to E:\Users\User2. Restart the computer. Now test by logging in as User, creating a new folder on the desktop. 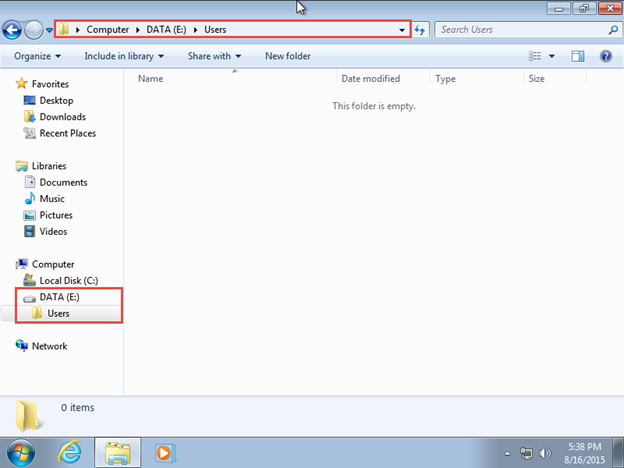 Then check to ensure that that newly created folder is stored in E: drive. 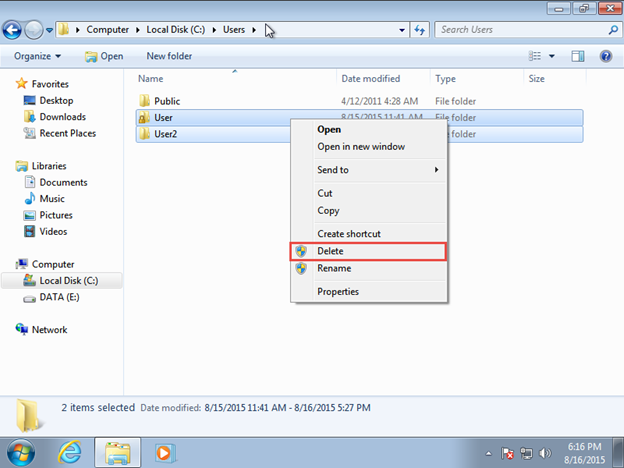 Create a new folder called TESTUSER on the desktop. Launch the command prompt and type SET. Verify that the profile is in E:\Users. Also verify that the newly created folder is stored in the right location. 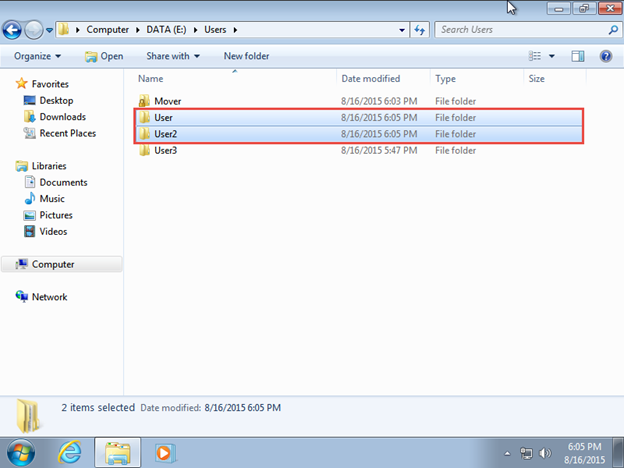 Now it is safe to delete C:\Users\User and C:\Users\User2 as well as the Mover account.